Credit ratings can be all important when it comes to obtaining a loan or any other form of credit. Credit ratings will be one of the main influences as to whether or not a lender considers an applicant a good credit risk. Credit ratings are a type of financial report card that detail a person’s borrowing and repaying habits. Credit ratings can contain details of any missed or late payments to credit cards, loans, and mortgages. Credit reports will also hold personal information such as present and previous addresses, whether the applicant is registered on the electoral register, and whether the applicant has cleared or outstanding debts. Every time a person applies for a loan the lender will look at the applicant’s personal credit report. They will be able to gauge from the information as to whether the person will be a good or bad credit risk. Each lender will have their own criteria as to who they will lend to but credit reports will be an influential lending factor. Not registered on the electoral register. The applicant has been made bankrupt. The applicant looks over committed with too many lines of credit. The applicant may have a bad payment history or missed or late payments. There may be too many address changes within a short space of time. The applicant has left addresses without informing lenders. The applicant may have county court judgements filed against them. The applicant may have no records at all of any borrowing. If a loan applicant has a poor credit record it does not automatically mean that they will be turned down for loans. For example a few missed payments on a credit card or loan will not usually rule out applicants that are applying for a mortgage. Lenders will use other factors when deciding whether or not to give loans. These could range from salary details, how financially committed a person is already, and whether the loan will be secured or not. One of the biggest factors will also be whether or not the applicant can afford to make the repayments. One of the major ways that credit ratings can affect loans will be the interest rate charged. It may not make much sense to non business minded people but lenders will apply a much higher rate of interest to loan applicants looking to borrow money. Lenders know that when people are desperate to borrow and have few avenues to turn to they will pay high rates of interest. On the flip side, applicants that have very good credit records can achieve very low rates of interest when applying for loans. They can shop around to find the best interest rates and will often be offered very low or zero interest rates. If you want to save money when applying for loans then always make sure your credit rating is up to scratch. 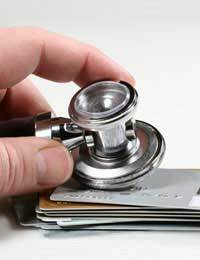 Having a bad credit rating can be seen as financial suicide. It only takes one or two missed loan repayments for a credit report to take on a negative appearance. Lenders will look unfavourably on people who miss loan payments, and for the borrower it also means penalty fees as well as the bad credit report. If you are shopping around to find the best deal always ask for a loan quote, do not fill in a formal application. Every time an applicant fills out an application a footprint will be left on their credit report. Too many of these footprints and it will look like the applicant has over committed themselves regardless of whether they have been turned down for a loan. Always ask for a quote first and do not give permission for credit checks until you have decided on the right loan for you. Credit ratings will have a major impact on the lender’s decision as to whether or not to supply a loan. These rating may also be a factor as to whether the applicant can apply for low or zero interest loans. A good credit record will go a long way towards successfully applying for a loan.